I got a certain gratification from the deflation of hype that came with My Little Pony: Friendship is Magic season 4. It became very clear that this cartoon was really nothing that remarkable, one in a long line that sat alongside all the other animation I watch in a fairly normal way. The fandom started to fizzle out and it seems people are forgetting being a ‘Brony’ was ever a thing. Can’t say that’s something I’m sad about. I watch so much animation that having to disassociate myself from a subculture just for watching this as well was a little tedious. But season 5 also lost me a little. I grew tired of it, stopped watching for a long period of time, and just decided to finish the season and start the next this past week. Trying very, very hard to keep their fandom alive with an episode full of in-jokes that the wider audience must have been baffled by in ‘Slice of Life’ rubbed me the wrong way, and after the mid-season break I just didn’t continue with the show for almost a year. There’s a real feeling of a show running out of steam here. The Cutie Mark Crusaders are finally given a pay-off moment, which honestly I thought would be saved until the last five or six episodes of the show, and was of course pretty anticlimactic. Continued episodes with them in season 6 can only be more so. Discord episodes become less of a treat and more flogging a dead horse, and bringing yaks into the equation just came over as very patronising. The flow of the season seemed very odd. Barely any rarity in the first half, but then way too much of her in the second, which is too much Rarara for any but her staunchest fans. 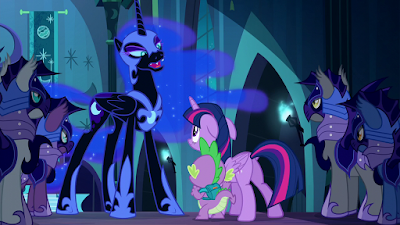 Pinkie is as annoying as ever, and while I liked the writing of the episode where Applejack meets her friend who is now famous, direct Lady Gaga references are going to get very dated very quickly, and were already hardly up-to-the-minute. It’s now very clear that Friendship is Magic is not revolutionary, is not going to break boundaries and is not going to provide entertainment that’s far more epic than expected. But I have to say, the variety of alternate universes glimpsed in the season finale, including several where the familiar characters are in a tough post-apocalyptic warrior setting, were a pleasant glimpse of that. I’d love to see those angles developed more, but sadly I know that’s not going to happen. Because this is no longer a show that has the capacity to surprise or redefine cartoons for girls. I’d like to say a new Powerpuff Girls would be more likely to accomplish that…but honestly, I don’t think we’ll see anything but the same old safe formulae there either. Not sure if that's consider a good thing or not? Since I've seen more fanart and animations still being made for that fandom today. More people are still being called bronies online and plus season 6 and a new animated MLP is coming out in 2017. So maybe some good could get into this show? You have to be into pop culture in order to know what show they are referencing. In a couple of years from now. Young kids who will actually have watch gen 4 of MLP: FiM will look back on it and realize that there's things that are new to the4m compare to when they were a few years old. 2000s like Mucha Lucha, Megas: XLR, and even shows like cyberchase of all things! Some shows are best left forgotten. But the shows that a kid will watch will one day be burned into their minds and they will learn a new perspective on life! I never even knew what dot meant by "Finger Prince" until I realize what a sexual innuendo years later! It's crazy to think that we used to be their age before the internet was even a thing. Even Rebecca Sugar starting watching Cartoon Network as a kid and the first show she ever watched on her television was Toonami! "Well? That show is done. "NEXT AOT SEASON 2!" But the kids who will see it go away will be inspire to make their own shows, movies, art, animation, and even work in the television industry because of Gen 4 of MLP. It may be a joke now for us silly old interweebs? But we would be biting our hats now once we hit our 40s or 50s and the new kids on the block will show us their new skills at life and we all be like.... DAMN! That's my 4 cents in the matter of cartoon shows.